Before the PDP-1, before the UNIVAC, before the ENIAC, there were differential analyzers. These analog computers solve differential equations without bits or bytes. 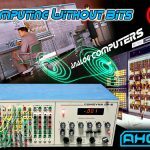 This time, we will look at how electronic analog computers work and how they are used. Then we will see a real analog computer in action, integrated with a modern digital computer. Brian will also be bringing the 6809 single board computer, which he just designed and built! Next, David Greelish will give us a short slide show of highlights from the KansasFest event he just attended. With the analog computer demo, 6809 SBC, KansasFest slideshow and all of you fine folks, this should be another great event! This entry was posted	on Tuesday, August 7th, 2012 at 8:56 am	and is filed under Meetings. You can follow any responses to this entry through the RSS 2.0 feed. Both comments and pings are currently closed.